You hit your back with every possible technique and exercise week in and week out. You even have been able to progress with the weights that you are using. So why hasn't your back grown in ages? You need to rethink your back training plan and implement these six techniques to get your back training back on track. Your back defines your physique. It gives you that much sought after V-taper that can make you look huge. If you work out and aren't looking for that shape you have a problem. A V-taper is what really fills out your t-shirts. You look wide, large, and in charge. An impressive physique is never complete without a set of wide lats and a thick back. Many people have a hard time developing their backs though, and for good reason. You can't see it. It's very hard to train what you can't see. Today I am going to talk to you about the best ways to feel your back working when you are having trouble doing so. First I'm going to have to show you exactly what the muscles of the back are and how they function. The two main parts of your back are your Latissimus Dorsi and your Mid-back, which is composed of the Trapezius, the Teres Major, and the Rhomboids. The Latissimus Dorsi's function is to move the arms down to the pelvis and bring the body up towards the arm when the arm is fixed. The Trapezius is used to shrug, pull the shoulder blades down, or draw the shoulder blades together. The Teres Major's function is to bring the arm towards the back. And finally, the Rhomboids share a common function of the Trapezius as they bring the shoulder blades together. Now that you know all of the muscles that are affected while you train your back, you can begin to understand the things you are doing wrong while training and how to really feel your back working. The most important thing to do on every rep of every set of every back workout is to squeeze it. Most of the time the reason you can't grow your back is because you can't feel it. Hold the contracted position of each back lift for one second and if you still can't feel your back working you are probably still performing the movement incorrectly. 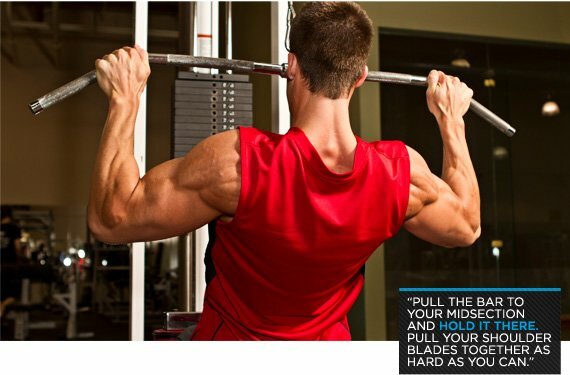 If you are doing pulldowns hold the bar at your chest and pull from your elbows to hold it down. If you are doing rows (cable or barbell rows) pull the bar to your midsection and hold it there pulling your shoulder blades together as hard as you can. That pump you get after a full set is your back muscles working. Good job, you just found your back! You're doing better than most guys out there. Your mind is just as important when lifting as your body is. Because you can't see your back working you have to imagine it working instead. Before you start your back workout start to visualize your exercises; pull-ups, pulldowns, rows (dumbbell and barbell), deadlifts, or whatever you are doing that day. Imagine that you are working your back and only your back when doing these exercises and visualize yourself doing these exercises from behind. Visualize what you would look like if you were standing behind yourself. Watch as your back contracts in your mind and do your best to replicate this feeling in the gym. A lot of the time when I do my back workouts I close my eyes for exercises like pull downs and cable rows. When I do each rep I watch (in my mind) my back contracting when it should. By doing this I always feel my back working to its fullest. Because I can see my back working I can make it work a lot more effectively. Always visualize your back flexing and contracting while you are working your back and you will have a much easier time feeling the muscles that you are trying to work. I hate straps. I think they rob you of some very precious forearm stimulation during heavy rows and deadlifts. There is one time that I have felt that straps can help, though, and that is when you are having a hard time targeting your back muscles. A lot of the time when you can't feel your back working it's because of the fact that your forearms and biceps muscles are giving out and getting fatigues much earlier than your back muscles are. This happens a lot more as beginners, and it can be a huge pain. Go to a sporting goods store and grab a good pair of lifting straps. Or you can pick some up on Bodybuilding.com. When you start to use them you won't have to worry about your forearms and biceps anymore and your back can take the brunt of the work. Imagine pulling from your elbows and using your arms as levers (with straps that's all they pretty much are) and do your workout. You will no doubt feel the burn in your back instead of your biceps and forearms. You have an ego. As a weightlifter I promise you that you have an ego. And sometimes that ego can kill the effectiveness of your training. Don't let it. Maybe one of the most important parts of back training, and any training in general, is to only use a weight that you can actually handle. If you are training your back and swinging your body on every rep with horrible form then you are using way to much weight with your exercises. If your back is rounded on deadlifts, rows, or any of the lifts for your back then lower the weight. If you have to throw your entire body into each lift then you are using too much weight. I know that once you hit a certain weight with things, like barbell rows, you can't help but swing a little but keep it too a minimum. If you are doing any of these things then you need to lower the weight you are using on your back exercises. That is probably the number one reason why people can't feel their back working. Lift the weight and really feel your back on each rep even if you feel like a girly man it'll help your back training tremendously. Sometimes getting the pump isn't such a bad thing. Pre-exhausting is a technique that has been around for a very long time and works very well when you are having a hard time feeling a certain muscle being worked. When you work out your back you are using the big exercises (I hope) like rows and pull ups as the core of your back training. It can sometimes be very hard to work your back on compound exercises like these when so many other muscles can be working also. Add in an isolation exercise for high reps before you do your compound movements and you will have a much easier time feeling your back work during those compound movements. 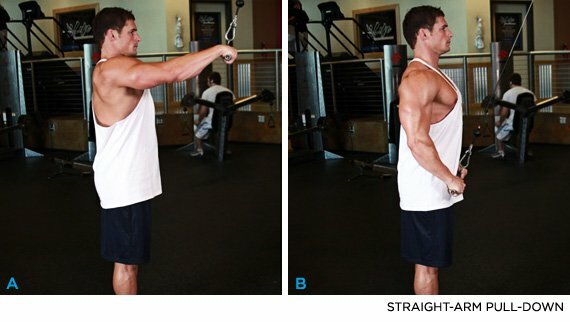 A good exercise that I use if I'm having trouble feeling my back work is a straight arm pulldown which is when you take a cable machine set on the highest positions, and grab it palms down. You keep your arms straight (as described in the name) and pull it down to your thighs all the while keeping your arms straight. At the bottom position, by your thighs, squeeze your lats. Do this exercise for 12 - 15 reps and then go onto your compound movement and feel your lats work like never before. As I mentioned before when I talked about using straps, I mentioned your forearm and biceps strength coming into the picture and limiting your back performance. You use your forearms and biceps in every single back movement (except for maybe the old nautilus lat machine). The problem is that your biceps and forearms are a whole lot weaker than your back. If they aren't, then you're a freak of nature and I gotta admit I envy you a bit. Bring these body parts up, especially your forearms. I know you'll all be like "but I train my arms all the time and they're wicked strong man" but it's really more the forearms that have a profound affect when doing things such as rows and pull ups. Train grip exercises more than anything if your main goal is to aid your back training. By training your grip you can hold onto the bar longer therefore making your back work longer. Improve all of your forearm numbers and bicep numbers and I promise that they will translate to better back exercises. IFBB Pro Bodybuilder and Team BSN athlete Brandon Curry continues his big-bore gun assault in Part 2 of his bicep training, then offers some techniques for forearm development. Training your back with these techniques will bring it up to speed with the rest of your body and lead to a much better quality of lifting. Why wait another day, start on your journey to a better back right away.